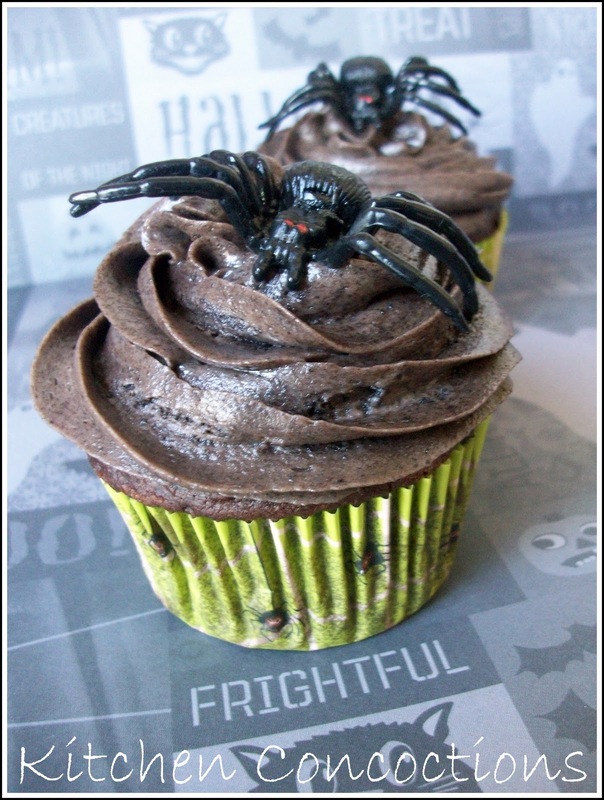 Spiders, Cupcakes, and Giveaways… Oh My! Thank you to all of you who have continued to read this blog day after day, post after post. Because I am so happy I have reached 200 posts and still have all of you in tow I have a giveaway to share later today! But first today’s Ghoulish Grub recipe! 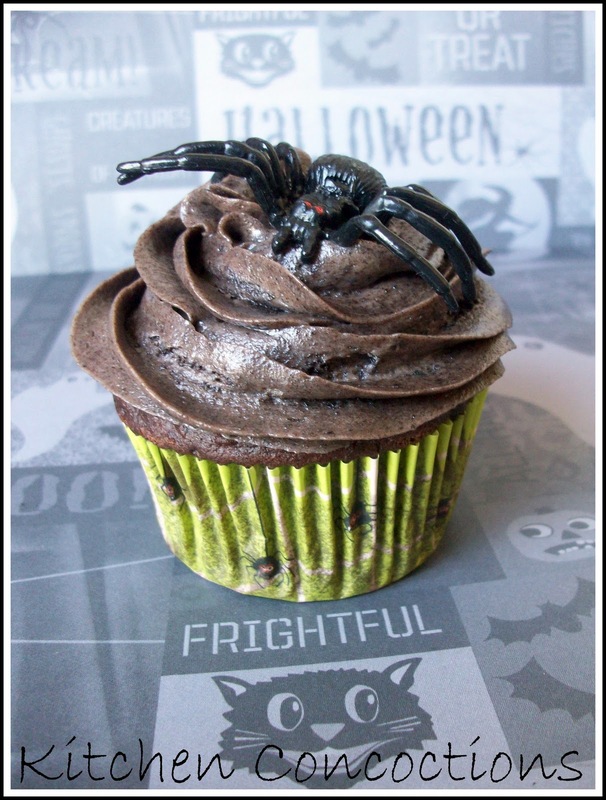 Today’s Halloween themed recipe is actual a twofer, a frosting and a cake, (and a giveaway) oh my! This Halloween recipe is not necessarily just for Halloween but could be made any time, and should be made regularly because it is so dang tasty. It is Halloweenish because it has that dark spooky look going for it. And topped with a fake spidey these cupcakes will be perfect for any Halloween get together you may be having this weekend. First the cupcakes. These chocolate cupcakes were unbelievably moist and full of flavor. To make this cake even ‘sweeter’ it takes only seconds to whip up and has only three (yes only 3) ingredients AND (this is huge, so listen closely) each of these cupcakes ONLY count as 1.75 Weight Watchers points! Now that’s something to write home about. These cakes are super tasty plain or topped with a little Cool Whip. Also they are so versatile and the cake/soda combinations are endless. But of course I had to go and take a somewhat ‘healthy cupcake’ and ruin it make it better by adding a crazy good frosting. Preheat oven according to box directions. Spray 9 x 13 pan (or for cupcakes you can use paper liners in the cupcake pan). Beat cake mix, diet soda and egg whites. Pour into pan. Bake as directed on box, or until toothpick comes out clean when inserted. Let cake cool about 10 minutes before cutting. Cut into 12 pieces. Top with fat free whipped cream if you wish. So the frosting. This frosting. Is great. Is good. Is perfect. Is a must. Beat it less for a grayish tent beat it more for a darker shade. Just what ever you do… Don’t eat all this frosting before you put it on your cupcakes! In a medium bowl, cream together the cream cheese and butter until creamy. Mix in the vanilla, then gradually stir in the confectioners’ sugar. Gently stir in Oreo crumbs. The more you mix the more gray in color the frosting will appear so do not over-mix. Store in the refrigerator after use. « Eyeballs. Eyeballs. And More Eyeballs. I loved cinnamon rolls for breakfast growing up! Im a follower already!